When you feel better, I'll ask you how to post this. 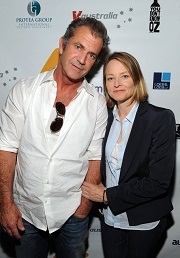 It's too much of Mel Gibson and not too much of Jodie. Thanx, AD. You don't like Mel? Will you be watching the Beaver? Well, I guess I agree since I can watch JF 24 hours, 7 days a week and from now until eternity, but, *whispers*, some people tend to take that the wrong way. Just don't stop talking to me, okay, Eugene?